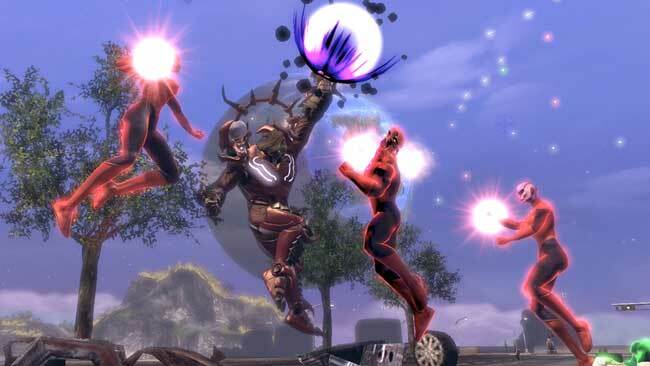 According to Jens Andersen, DCUO’s Creative Director, the first part of DCUO’s DLC Packs will feature new 4-man and 8-man Operations, new Legends characters, and a new power – Rage. First, let me say I was blown away by the job Spord and company did with this new power. I think you’re going to love it. Rage is a Tank/Damage power, and offers a whole new tanking mechanic that simply looks amazing. It’s a unique power with a unique twist that is new to DCUO. Rage powers are inspired by the Red Lanterns, who draw heir power from the Red Light of the Emotional Spectrum – a light associated with Rage. Heroes and villains will be able to wield this light using a special type of power ring only found in DCUO, which was first introduced when we created Light powers for the game. This new red power ring will tap into the the Rage of the emotional spectrum to create energy blasts, deadly blood plasma attacks, and even some vicious constructs. Most importantly, it allows player characters to retain control of their reason, much like Atrocitus or Guy Gardner, so that they can make their own moral choices – will they wield this light with righteous fury or be driven by vengeance and petty anger? That choice will be yours. Rage offers players the usual Damage stance that comes with all powers, and this one is might based, so spec your characters accordingly if you like to lay down the damage. It also has a Tank stance, with the exciting new mechanic called “Rage Crash.” Players can activate certain abilities to send them into a state of extreme rage. When in this state, any damage taken is instantly healed. This effect lasts for the duration of the ability, and once the ability fades, all of the damage taken during that time is instantly reapplied to the character. This event is called “Rage Crash.” Other powers can be activated to mitigate the damage hit when the Rage Crash occurs or, even better, skilled players can activate rage combos that will render them immune to the effects of Rage Crash. If you truly master rage powers, and everything goes right, you are a beast of a tank. But it’s a system fraught with danger, so deciding whether you want to go for complete Rage Crash immunity or mitigation will lead to a variety of new tactics for players (and for their healers!). It is extremely cool and really represents the emotions of the power it seeks to emulate. I know you will enjoy it. It’s no secret that we are introducing the Blue Lantern Corps to DCUO. They will join the roster alongside other members of the Green Lantern, Sinestro, and Red Lantern Corps already in the game. Of course, the Blue Lanterns would not be complete without their leader, Saint Walker. With him entering the game, it seemed like the perfect time to add a few new iconic characters to Legends PvP. We are thrilled to announce you will be able to slip on the power rings of two new characters: Atrocitus and Saint Walker. Saint Walker wields the blue light of Hope. His combat style is martial arts, which is very fitting for Saint Walkers, who always felt to me like a graceful fighting monk. We went with that direction when we created his VFX and special animations to truly make the character feel unique. He has some cool protective abilities, amazing combos, and a powerful finishing move that sports an awesome kata style animation before he delivers the knockout blow. Oh, and his supercharge is awesome; it nails the Blue Lantern feeling to a tee and the animation and special effect for it is perfect! Atrocitus is, as you would expect, completely brutal. He is all about damage and very little in the way of defense. But hang on, before you get to worried, let’s talk about his mechanics. Just like Rage powers, Atrocitius can go into a Rage that allows him to instantly heal any incoming damage, allowing him to wade through incoming attacks and deal out some punishment. The good news is there is no Rage Crash at the end of it. He also has an awesome blood spewing attack that creates a huge pool of plasma. Anyone caught inside of it will take extreme damage from Atrocitus’ attacks. So, better get out of the way when this guy gets upset, because he’ll stomp you down into a puddle. There is an entirely new version of metropolis coming to the game, one that exists separately from the original, and is ready to be the stage for all three War of the Light DLCs. In this first part, strange, prismatic mists have appeared in the city. Each color of the emotional spectrum is represented. The mists are beginning to affect the civilians in the city, causing them to exhibit various emotions associated with those colors: crimson mist causes rage, topaz causes fear, azure causes hope, emerald determination, and so on. The Corps are being drawn to Earth to find out what connection these mists have with the Emotional Spectrum, thus sparking the War of the Light. The battle spills out onto the streets. In the skies above Metropolis, Mogo and Ranx have arrived. You can look up and see them engulfed in a battle between lanterns from all four corps. It’s quite a breathtaking view. Players will participate in these battles by undertaking 3 new operations per faction. There are two four player operations and one eight player operation per side. These operations take you up to Mogo and Ranx, and into some all new environments as well as on the city streets of the new shared Metropolis zone. Weaving in and out of these public and private spaces, players will interact with both new and old iconic characters from DCUO. One of the more exciting aspects is the way the mist can sometimes take control of an iconic character, infusing them with raw emotional might and turning them into a powerful avatar of Will, Fear, Rage, or Hope. Two of my favorites are Blue Lantern Flash and Green Lantern Hawkman – speedy and powerful, they are a sight to see, and there are many more. We’re also introducing many new characters like: Brother Warth, Bleeze, Arisia, Red Lantern Guy Gardner, and Blue Lantern Kyle Rayner. Some exciting stuff is happening in the stories for this DLC, and it is just the first part of the trilogy! So get ready for a heavy dose of DC fan moments to enjoy. Of course, we also have exciting new gear and styles to earn throughout the DLC Pack. There are three new iconic Lantern-inspired styles to collect in War of the Light Part I. We’ve had lots of feedback from players to slim down the look of our gear, and these definitely accommodate. Sleek and full of detail, these styles are meant to mix-and-match with each other to allow players to create unique and varied combinations, while still looking like they belong in the ranks of each Corps. Most exciting is the fact that, for the first time, you will be able to collect style gear with the Corps logos attached. Heroes will be able to earn the Green Lantern inspired gear, while villains can earn the Sinestro Corps inspired gear. Both factions will be able to obtain the Red Lantern inspired gear, to go along with the new Rage powers. Not only are there exciting styles, but we have a promising new format for delivering the loot rewards to you. Gear and styles will be available for purchase on vendors. This includes all the primary gear slots as well as necks and rings. Weapons are also being made available for purchase on vendors, and they will no longer be drops on the loot tables. This addresses some long standing feedback about the rewards in our game, and we’re happy to take this opportunity to implement a new system. However, there will still be some random drops found in the instances, and these drops will be the best gear available to players by a very slim margin. The stat delta is not extreme, so it certainly will not be a requirement to have this gear, but it will be a nice bonus for you to try and acquire these pieces over time. These pieces of gear also share a style-only purchase available on vendors, so the DLC’s styles and style-feats can be acquired through marks or luck, and it will be up to you which route you want to take to acquire them. It’s much easier to see this in action, so when we do a livestream or get the DLC content up on test, we will expand more on the specifics of the set up. The important thing to know is that the rewards for War of the Light rely much more on completing the content than on luck, but that there are still some surprises to look forward to in the moment. This entry was posted in Breaking news and tagged DCUO DLC Pack, Rage, War of the Light. Bookmark the permalink. I’m just wondering if there is a date that this will be up on the PC test servers. I am wondering when this is going to be released? I play on PS3 but still, a release date? They were saying it’d be out in January. They’ll probably release it right after or right before all the free month play is up. Hero red lanterns from sector 666 really SOE? If you actually read the comics you see that the Red Lanterns aren’t inherently evil. They bring justice to their sectors, just through violent methods. They can be heroes, anti-heroes or villains. What gear is the precision gear ???? I find a pity that it is a new Metropolis again. and its unreal, its not a invasion. where? is see nothing in metropolis. and where is the planet mogo and Ranx the wuden touted? the 8 man raid in the small cave? that is the whole planet? War of the Light Part I also brings two new Legends characters to the game, Saint Walker and Atrocitus. Saint Walker, as a member of the Blue Lantern Corps, wields the blue light of Hope. His fighting style is martial arts, fitting for a warrior monk. He has some great combos, very effective protective abilities, and a powerful finisher with a great new animation.